This Cauliflower Fried Recipe is an easy and delicious weeknight meal. 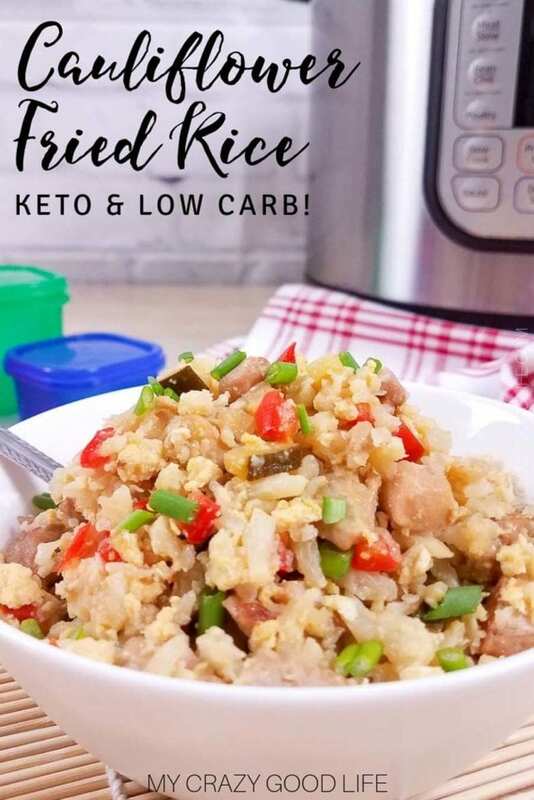 Cauliflower Chicken Fried Rice is low carb and keto, healthy and so easy to adapt to your preferences. 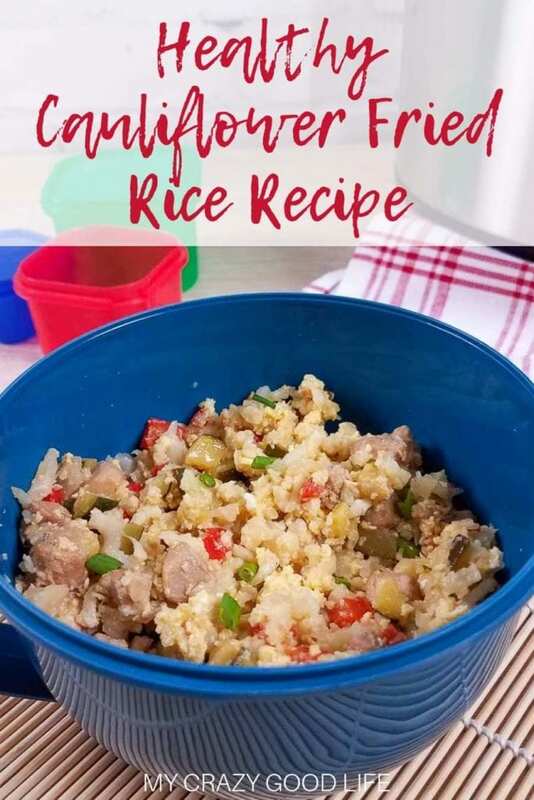 21 Day Fix Cauliflower Chicken Fried Rice is a great way to get all of your green containers in, and Weight Watchers Cauliflower Fried Rice has only 3 points per serving! Add all the ingredients to your slow cooker except the cheese and eggs. Cover with the lid and cook on high heat for 2-3 hours, low heat for 4-5 hours, or until the chicken is cooked and the cauliflower is tender. Remove the lid and break the cauliflower into pieces with a fork. Mix in the cheese and allow it to melt. 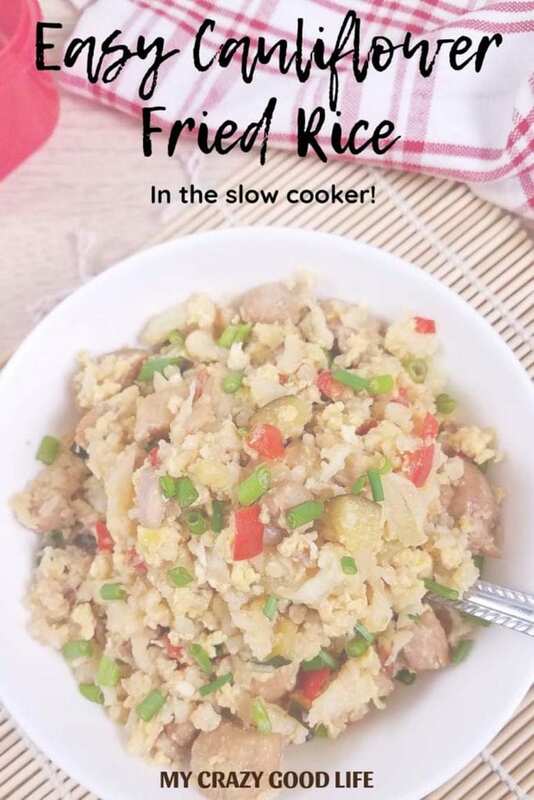 In a skillet scramble the eggs then mix them into with the fried rice in the slow cooker. Serve or pack for meal prep. Add the olive oil to the Instant Pot and press the sauté button to heat the oil. Sauté the garlic and onions in the Instant Pot for about 1 minute until they start to soften. Add the chicken and let brown for 2-3 minutes. Once the chicken has browned dump in the bell peppers, zucchini, cauliflower, coconut aminos, and lime juice. Close the lid and turn the pressure valve to sealing. Cook on high pressure using the “manual” or “pressure cook” button for 1 minute. Release the pressure by doing a quick release. Open the lid. Use a fork to break apart the cauliflower into small pieces to make your “rice”. If there is a lot of liquid from the cauliflower and zucchini drain some of the liquid. You’ll want to keep about 2 tbsp of liquid for added flavor. Instant Pot back to sauté mode. In a small bowl whisk the eggs then slowly pour the eggs into the empty side of the Instant Pot to cook.You can spray your pot with coconut or olive oil first if you need to. 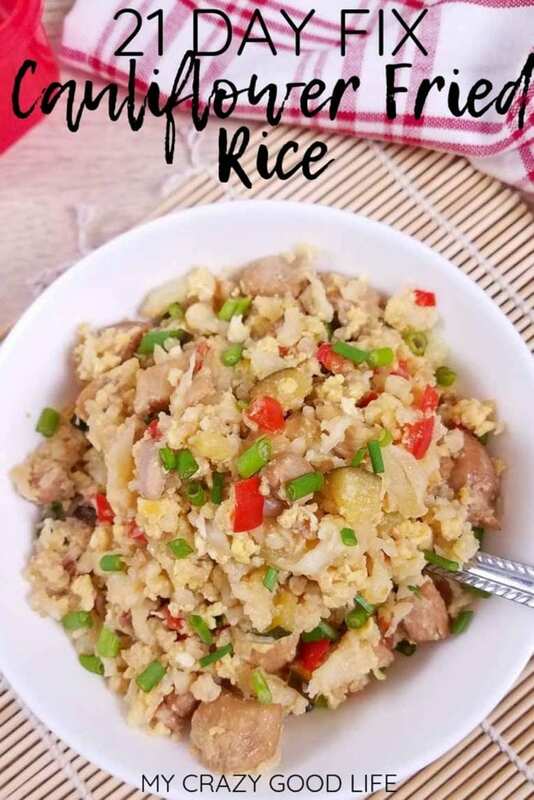 Scramble the eggs and then mix together the eggs and cauliflower fried “rice.” Serve or pack for meal prep. 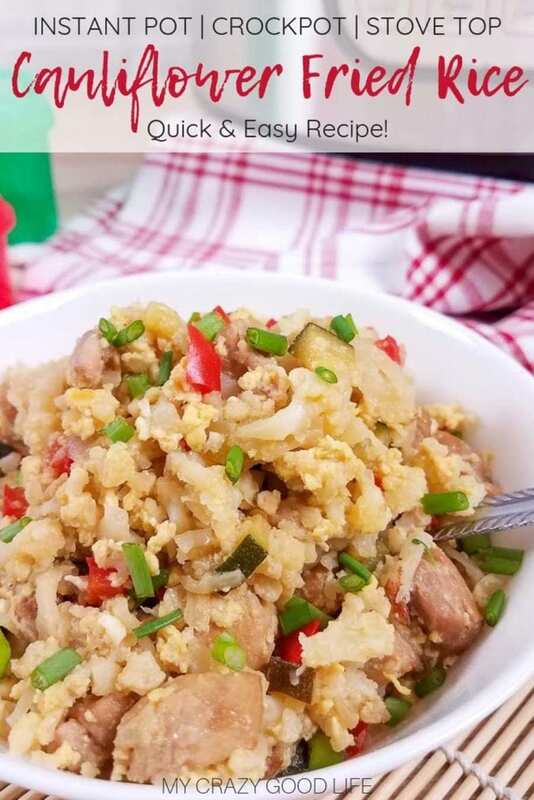 How many carbs are in this cauliflower fried rice recipe? 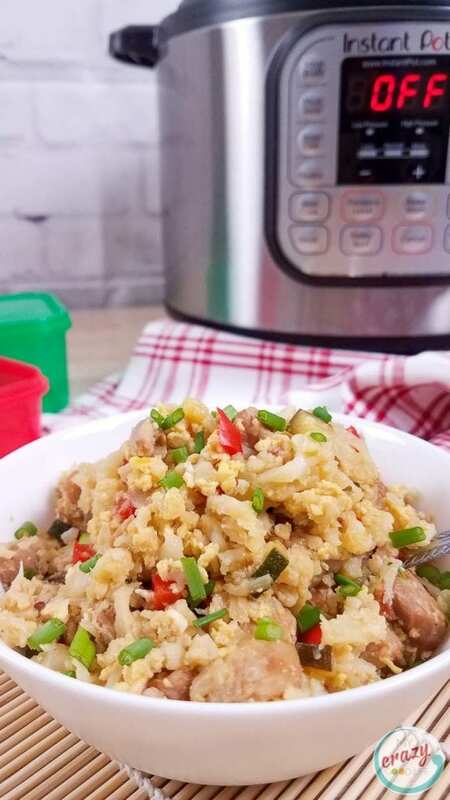 There are 18 grams of carbohydrates in each serving of this Cauliflower Chicken Fried Rice. 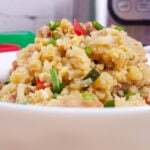 Can you freeze this cauliflower chicken fried rice recipe? You can freeze pretty much anything…in this case I wouldn’t recommend it though. Freezing cooked cauliflower is a recipe for mush in my opinion. If you are cooking for one and really feel like you won’t be able to use this up before it would go bad, I’d recommend cutting the recipe in half. Try using this recipe for meal prep. 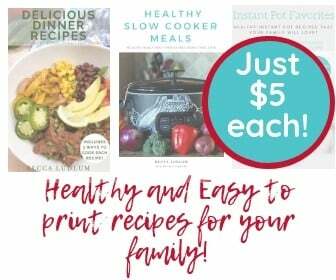 It’s great for dinner tonight and lunches a few days throughout the week! How do I make this recipe if I’m cutting it in half? Just take half the amount of ingredients and cook as described for your chosen method. It’s not necessary to alter the cooking times, everything will come out just fine! 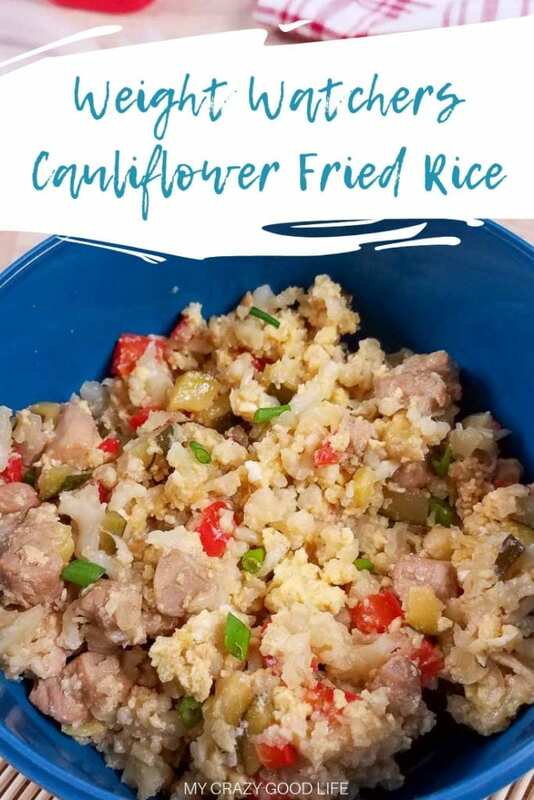 Is there a way to make this cauliflower fried rice on the stovetop? Heat the oil in high heat in a skillet. Sauté the garlic and onions for 1-2 minutes until they start to soften. Add the chicken, zucchini, and bell peppers. Let them sauté for 1-2 minutes. Turn the stove to medium heat. Add the cauliflower, lime juice, and coconut aminos to the skillet. Cover the skillet and allow the cauliflower to cook for 10 minutes or until it is tender and broken easily with a fork. Mix in the cheese until it is melted. Then push the cauliflower rice to the side. In a small bowl whisk the eggs then slowly pour the eggs into the empty side of the skillet to cook. 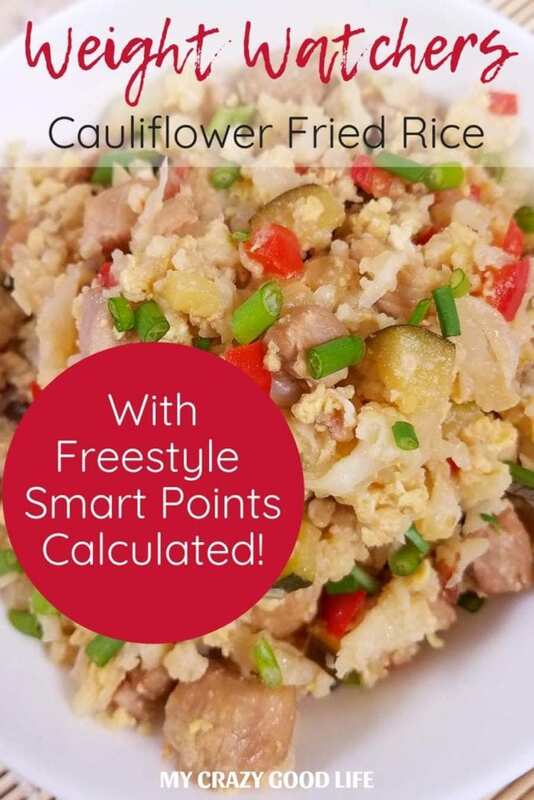 How many Freestyle Smart Points are in a serving of this Weight Watchers cauliflower fried rice? 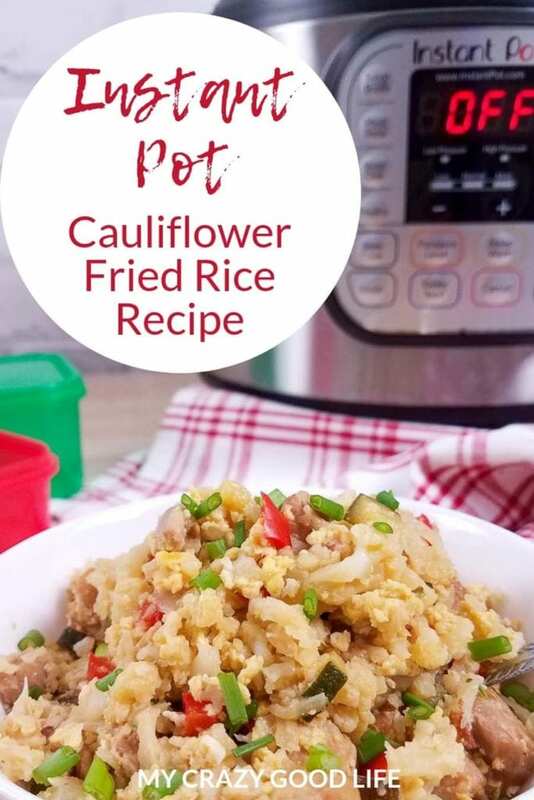 Each serving of this cauliflower chicken fried rice is 3 Weight Watches Freestyle Smart Points. That is a great low point recipe for lunch, dinner, and for meal prep. I didn’t factor in any of the optional ingredients so be sure you add those in if you are adding cheese. If you are looking for ways to reduce the points you can always make this with boneless skinless chicken breasts, which will remove most of the points. Personally I would use the thighs because it makes it more flavorful. Saute the garlic and onions in the Instant Pot for about 1 minute until they start to soften. Close the lid and turn the pressure valve to sealing. Cook on high pressure using the "manual" or "pressure cook" button for 1 minute. Release the pressure by doing a quick release. Open the lid. Use a fork to break apart the cauliflower into small pieces to make your "rice". If there is a lot of liquid from the cauliflower and zucchini drain some of the liquid. You'll want to keep about 2 tbsp of liquid for added flavor. Mix in the optional cheese until it is melted. Then push the cauliflower rice to the side and turn the Instant Pot back to sauté mode. Scramble the eggs and then mix together the eggs and cauliflower fried "rice." Serve or pack for meal prep. Turn the stove to medium heat. Add the cauliflower, lime juice, and coconut aminos to the skillet. Cover the skillet and allow the cauliflower to cook for 10-15 minutes or until it is tender and broken easily with a fork. 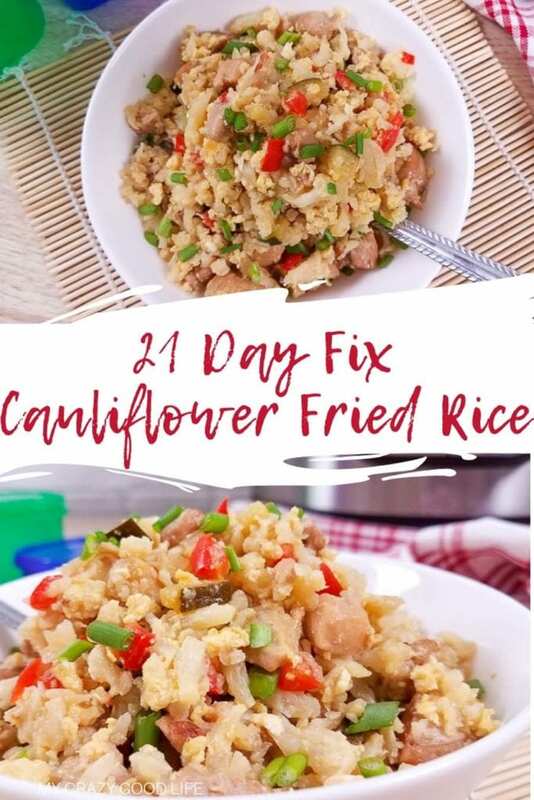 Use a fork to break up the cauliflower to form your "rice". Love making fried cauliflower! Best recipe out there!! This is so good! I think I may like this even better than traditional fried rice!